In the current era, web development is emerging as an extensively popular technology. The merchants who have opted for online platforms for the purpose of marketing and selling are in the massive requirement of a decent web development service. HTML5 editor stands among the most widely utilized editor by web developers and designers as it offers different variations in functions and services, and systematically guides them in building a handy web application. As per the stats offered by statista, HTML5 is utilized by 83.9% of the websites which make use of HTML across the world. This industry of web development has witnessed a boom period in the mid-90s. Presently, we can experience extensive growth in the proportion of web development firms which strives to offer the top-notch quality of services. An HTML5 editor can be referred to as an independent tool, but it is also an essential facet of a massive integrated development environment (HTML5 IDE). Basically, it is a toolbox which is used by the developer to acquire space for editing, assembling, analyzing and debugging codes. An HTML editor is a kind of equipment which supports the user to trial their codes. Though any of the word processors can be used for the purpose of typing codes, an HTML editor provides you certain tools which ensure that the codes are efficiently jotted down. At a very basic level, the HTML editor offers the facility of correcting syntax and checking spellings for the codes. Along with these, HTML editor offers featured such as syntax tracking, that highlights various facets of the side which makes it simple to read by diversifying the various facets online-by-line basis. Generally, it permits the user to add or auto-complete the basic HTML factors. HTML5 is the most extensively utilized language by designers and developers as it offers a wide variety of functions and solutions, along with navigating the developers in building highly convenient and easy to use applications which run across different platforms. There exist a plethora of reasons as to why HTML5 is so famous among web developing companies. Some merits can be stated such as great browser support such as Google Chrome, Firefox, Internet Explorer 9 and much more, tags based on particular structures, a fresh set of videos, audios, and canvas elements, drag and drop interactions, visual elements such as built-in rounded corners zone unit. It holds the ability to maintain the top position in most of the famous websites verticals like news, shopping, business, education, travels and much more. These days, on an average more than 5k software architects, are frequently making use of HTML5. It is coming up as a predominant alternative for developing apps on any web platform. Additionally, the factor promoting the popularity of HTML5 editors is the property amalgamation of scalable vector graphics content or SVG which is the substitution of generic HTML5 editor, which is often regarded as a software package or equipment which facilitates web architects to reform interactive markup language web page or websites. Let us check out the list of the freshest and highly preferred HTML5 website editors for developing ever-changing and communicative web applications. The entire development procedure with the help of Aloha Editor is very rapid than any other kind of HTML5 editor present across the market. Aloha Editor functions approximately 25% more quickly by taking up some additional steps such as typing and formatting. This HTML5 editor also delivers improved user experience, and this is the reason most of the e-commerce development establishments across the country prefer to make use of Aloha Editor. Maqetta is referred to as an open source assignment which delivers WYSIWYG optical authority of the HTML5 interface. It is independently activated in HTML, and functions on the browser, without any requirement of additional downloads or plugins. Maqetta is employed in the category of open source license which is very compatible with commercial platforms. Maqetta was successful in securing a place among the top ten most preferred latest versions utilized in the current era. Aptana Studio is also a kind of open source building equipment, which is largely utilized by new budding web developers. It aids the software building establishments across India to check their web applications with the help of an individual environment only. These days, Aptana Studio 3 is the most freshly launched version utilized by web developers. One of the drawbacks about Aptana studio which is popping up in the absence of updates. Aptana Studio along with Twitter and Facebook has launched their 3.6.0 versions in July 2014, after which nothing fresh came up. Although, Aptana holds all the potentials to avail the second position in the top ten most popular HTML5 editors for web development the deficiencies of fresh updates should be taken into account. Mercury Editor stands out the be an HTML5 editor which is rich in features. It is developed by trailing the HTML5 content editable properties. Other properties of HTML5 in the aiding list of Mercury Editor consist of picture zones, snippet, markdown, and simple. An alternative of going through the preliminary study of the edited content and links, pictures, inserting tables or videos also come with it. Drag and drop HTML editor characteristic is also present for serving file upload. File uploads can be achieved with the help of drag and drop feature. Rendra refers to an online HTML5 editor which server a real-time preliminary study of the task the user is performing and also converts it into Cascading Style Sheets (CSS). HTML Abstraction Markup Language (HAML), as well as Syntactically Awesome Style Sheets (SASS), is also aided by Render. The users of Web Design and Development Services experiences ease while functioning with Rendra on HTML5 and CSS3. The foundation of Rendra editor is Sinatra as well as CoffeeScript. It is a freshly launched WYSIWYG (What You See Is What You Get) content editor used for the World Wide Web. There exists a rendering engine of Firefox browser in it. It offers contemporary and powerful solutions for editing web pages to follow the newly launched Web Standards. As Blue Griffon, is an inborn application, the newcomers have a very handy experience functioning with it. Blue Griffon holds a very straight-forward design, and hence it is very handy in usage, even for the beginners. It is a WYSIWYG (What You See Is What You Get) editor which aids HTML4 and HTML5 along with facilitating open source XHTML editor. It is also well-equipped with the potential of directly immersing HTML5 audios and videos into the desired web page. Essential HTML factors, such as paragraph tags, footers, and headers are present in a drop-down menu, so the web architect can use them very swiftly into in web page with a handful of clicks. Blue Griffon is an excellent equipment and stands out the be a tough opponent for the rest of the programs in the race of attaining the most popular HTML5 editor for web development. Blue Griffon is a free html5 editor and the user can download it from any browser-based platform. MacFlux is a kind of commercial application for mechanisms functioning on Macintosh. It aids HTML5 as well as other browser technologies such as JSP, Ruby, PHP and other languages depending upon the text. As per the expert view, it holds an innovative design atmosphere instead of a straight-forward template based solution. Bluefish is a robust editor for web architects that aid several kinds of programming and markup languages. It is a transparent and quick editor that holds various properties such as snippets sidebar, multi-processing support, automatic recovery and such. Some remarkable properties are being induced in BlueFish editor with the arrival of its 2.0 version which is testing code-sensitive syntax, automatically finishing various different languages such as PHP, CSS, HTML and much more, assignment management, Snippets and automatically saving procedures. Basically, Bluefish is a code editor and not especially a web editor. This implies that it offers web designers with the versatility of scribbling them in various other languages other than HTML. Although, if a web designer requires a web-intensive or WYSIWYG (What You See Is What You Get) interface, Bluefish will be inefficient in fulfilling your requirements. ‘Brackets’ is also a transparent, robust and contemporary HTML5 editor which is available along with focused optical equipment and string pre-processor help. Brackets allow the user to open a window within the codes which hold their maximum concerns and will display the user all the Cascading Style Sheets (CSS) sectors along with the ID in an inline window so that they can swiftly function with codes. The user can avail real-time interaction with their respective browser because of its property of live preview. Dreamweaver (DW) is a highly preferred HTML5 editor ruling the web industry. It aids Cascading Style Sheets (CSS), HTML5 and servers a preview panel with multiple screens, WYSIWYG (What You See Is What You Get) properties, integration with Adobe BrowserLab and jQuery Mobile. Dreamweaver is flexible and multi-skilled equipment which is worth the money the user pay to secure it in their toolbox. Moreover, Dreamweaver supports applications on multiple platforms such as iOS, HTML5 CSS3 as well as Android. From the data mentioned above, one can easily figure out that best HTML editor delivers a graphical user interface for web pages which the user creates. The question arises, what exactly is ideal HTML editor software for web architects? The answer to it is that the one which suits your preferences and effectively caters to your needs is the ideal one for you. 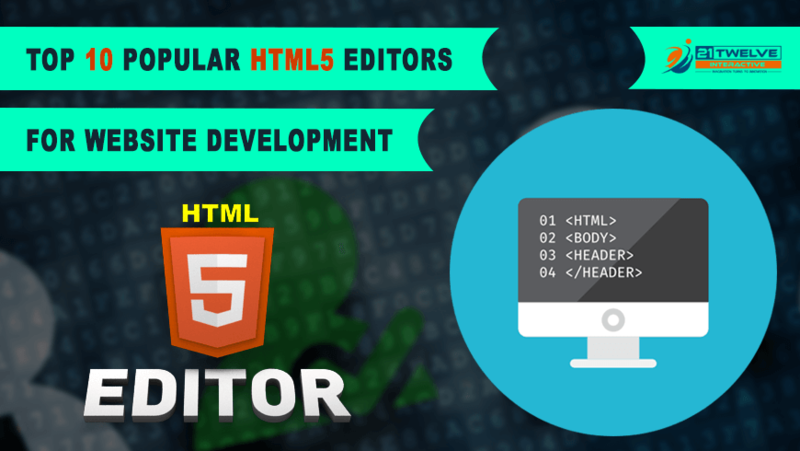 If you are not able to finalize one, then, try out various HTML5 editors, until and unless you figure out one which caters to your needs ideally.